Two 8.5 x 11 sheets featuring 1 paper doll and 6 outfits. 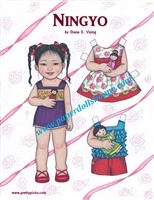 "Ningyo" is the Japanese word for "doll." Two 8.5 x 11 sheets featuring 1 paper doll and 4 outfits. Beautiful gift for a special doll friend! 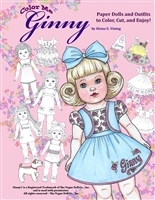 2- page paper doll set includes doll, 8 outfits, and several accessories. Two 8.5 x 11 sheets featuring 1 paper doll and 4 outfits. She can share outfits with her best friend, "May Flowers"! Two 8.5 x 11 sheets featuring 1 paper doll and 4 outfits. She can share outfits with her best friend, "April Showers"! Two 8.5 x 11 sheets featuring 1 paper doll and 4 outfits. Two 8.5 x 11 pages featuring 4 petite paper dolls and 10 outfits! These 4 cuties have been adapted from my "Well Wishers" greeting card girls, but are slightly smaller, and include 4 of the outfits from the greeting card designs, plus 6 all-new outfits! Two 8.5 x 11 sheets featuring 1 paper doll and 3 outfits. Very pretty girl with beautifully intricate clothing. It's my first-ever paper doll book! Four delightful dolls offer a garden of friendship and fun! Daisy, Jasmine, Lily, and Rose come with a wonderful wardrobe of 32 outfits -- two costumes each for all four seasons, plus loads of accessories. They're ready for fun, in winter coats or summer dresses, and a full-color play scene provides a background for their back-yard adventures! These paper dolls were a labor of love, and I created them with girls of ALL ages in mind. They are fun and trendy paper toys which appeal to younger girls, but also created with an eye for quality and detail, which appeals to the collector. This book is also available through www.DoverPublications.com and www.DoverPublications.com . However, if you'd like a SIGNED copy direct from the artist, feel free to order from here at the Paper Doll Shoppe and ask to have it signed in the "Comments" section at checkout. Published by Dover Publications, 2015. This 8.5 x 11 coloring book features 4 paper dolls, 30 outfits, and various accessories for you to color, cut out, and enjoy! This color, cut, and play activity is fun and relaxing for girls of all ages, because you get to design your very own paper doll set! The dolls' clothing, hair, eye, and skin tones are entirely up to you... so the possibilities are as endless as your imagination! Designed by a paper doll artist, for all levels of paper doll artists, it is in spiral bound notebook format, so that you can fold the pages back to concentrate on the page you're on. The pages are thick, perfect for sturdy stand-up paper dolls and outfits. Outfits range from "plain" (to add your own details) to intricately patterned. 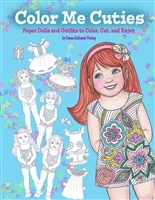 Just grab your favorite coloring tools and scissors and get ready for some paper doll fun! This 8.5 x 11 coloring book features 3 paper dolls, 33 outfits, and various accessories for you to color, cut out, and enjoy! This color, cut, and play activity is fun and relaxing for girls of all ages, because you get to design your very own paper doll set! The dolls' clothing, hair, eye, and skin tones are entirely up to you... so the possibilities are as endless as your imagination! Designed by a paper doll artist, for all levels of paper doll artists, it is in spiral bound notebook format, so that you can fold the pages back to concentrate on the page you're on. The pages are thick, perfect for sturdy stand-up paper dolls and outfits. Outfits range from "plain" (to add your own details) to intricately patterned. Many are inspired by some of the most beloved movie costumes of the 1930s, while others are brand-new designs... Just grab your favorite coloring tools and scissors and get ready for some paper doll fun!